Los Angeles, CA–The All-Armenian Students Association ("All-ASA"), a confederation of Armenian American college student organizations, adopted a resolution reaffirming their support for Genocide recognition as well as the self determination of Nagorno-Karabakh. In a general meeting held recently at Loyola Marymount University, delegates voted in favor of the resolution which was introduced by the Shant Student Association ("SSA"), one of more than a dozen organizations represented. The meeting was attended by more than 30 university students from throughout California and was the first general meeting of the All-ASA for the 2008-2009 academic year. "It is imperative that as Armenian American students, we voice our concerns regarding community issues, including the Armenian Genocide, the Turkish blockade on Armenia, and the self determination of Nagorno-Karabakh," said SSA Representative to the All-ASA, Caspar Jivalagian. The adoption of the most recent Armenian Genocide resolution in the U.S. House Foreign Affairs Committee in October 2007 sparked a firestorm of media coverage over the Turkish government’s threats to retaliate against America if the measure were approved by the full House of Representatives. Turkey has poured millions of foreign dollars into the U.S. political system, hiring both former Members of Congress to make its case and public relations firms to spin media coverage against this human rights legislation. In September of 1991, the people of Nagorno-Karabakh formally declared their independence, having previously voted overwhelmingly in favor of separation from the Soviet Union and Azerbaijan due to repeated suppression of rights and massacres of Armenia’s within Azerbaijan. Although Azerbaijan launched a failed full-scale war against the people of Nagorno-Karabakh, it has been unable to assert its authority over the region since the cease-fire brokered in 1994. To this day the Azerbaijani government repeatedly threatens a resumption of war to subjugate the de facto independent republic in violation of the international principle of the self-determination of peoples. "As students we understand that education is crucial to ensuring that the community at large understands Armenian American issues and our concerns," said Sevada Markosyan, who represented the Cal Poly Pomona ASA at the meeting. 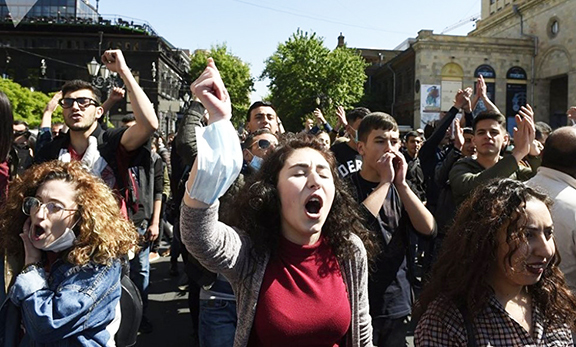 The All-ASA confederation provides a forum for participating independent Armenian American colleges student groups through which these organizations may facilitate cooperative initiatives and deliberate on issues faced by the Armenian college student community. Be it resolved, the All-ASA body reaffirm its support for Armenian Genocide recognition as well as its commitment to the territorial integrity of the Nagorno Karabakh Republic.